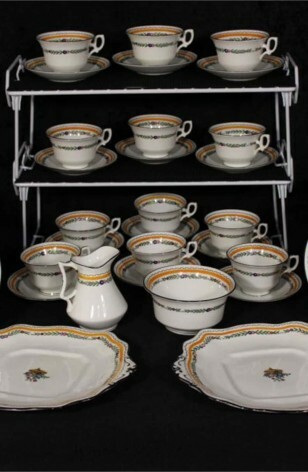 Antique - Adderleys LTD Tea Set. "Taunton" Pattern #06432A by Adderleys LTD, Made in England in the late 1800's, to early 1900's. A (39) Piece Set. A White Background with Blue, Pink, and Orange Flower Bouquets in the Center of the Plates, Surrounded by Laurel Band, Orange Ring, Black Zig-Zag on Outer Edge with 22krt Gold Rims. Also the same Trim on the inside of the Cups and Sugar Bowls.. with Laurel Wreaths Band on the Outside of the Cups, Sugar and Creamer. 11 - Bread/Dessert/Tea Plates - 6 5/8"